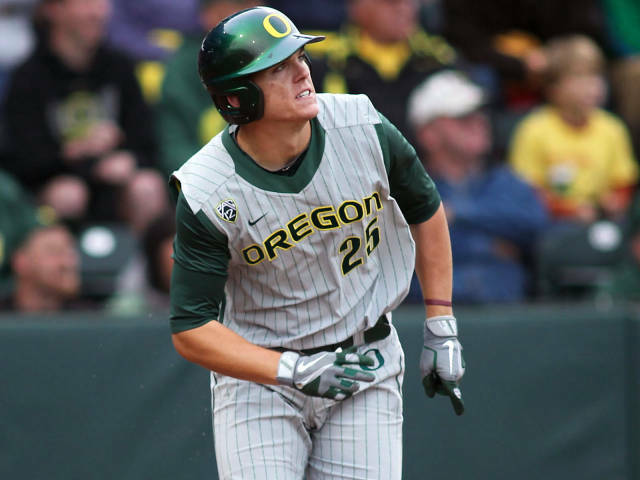 Fast starts and big numbers are the thing here in Eugene, and thus far, the baseball team has obeyed the M.O. The Ducks completed a season-opening four-game sweep over the University of Hawaii on Monday, making this the third Oregon team in as many seasons to open up the season with a winning streak of four or more games. They beat the Warriors 3-0, 5-4, 9-5 and 4-2 and are now ranked No. 6 in the country, up four spots from last week. While knocking off Hawaii isn’t greatness-affirming, it is at least a sign that George Horton’s Ducks are more than a flash in the proverbial pan. J.J. Altobelli, SS — The senior infielder had himself a hell of a Presidents Weekend: Over the four games, he hit .462 with 5 RBI, 3 runs and a SB. Ryon Healy, 1B — The 6’5 first baseman absolutely raked this weekend as well, hitting .533 with 4 RBI and 2 runs. On Saturday, the junior smacked three doubles, and then on Sunday, he followed it up with a four hit, 3 RBI performance. Jake Reed, SP — The sophomore righty tossed six scoreless innings of baseball to open the Ducks season in front of a sold out Les Murakami Stadium crowd. He allowed just six baserunners (a 1.00 WHIP!) while striking out seven batters on his way to the win. Brett Thomas, LF — It would be unfair to mention Reed without making note of Thomas. The junior left fielder made an outstanding diving play in the sixth to bail Reed out of a jam, and drove a run in during the contest as well. Aaron Payne, 2B — The junior second baseman scored four times over the weekend in addition to driving in another key run in the opener. The Ducks play their first home game on Friday against Loyola Marymount. No official word yet on how the field, the balls or the palms of the catcher’s hands feel about this, as they have declined to comment. Fear is widely speculated to be the cause for the silence.